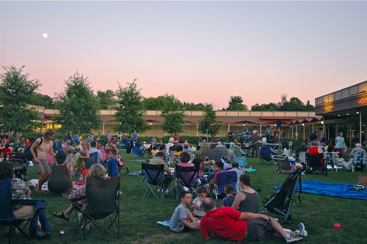 PORTRAIT OF A COMMUNITY: A scene Manet or Seurat might have painted was taking place at Thursdays Courtyard Concert at the Princeton Shopping Center. The featured performer was singer/piano player Sandy Zio. Lisa Botalico Fiesta Flamenca with Alborada Spanish Dance will perform next Thursday, August 18, and the season will conclude with a return engagement by the Klez Dispensers on August 25. Concerts run from 6:30 to 8:30. Two competing visions for the future use of the Valley Road building were presented to the Board of Education last week. The Valley Road School-Adaptive Reuse Committee (VRS-ARC), a grassroots effort to prevent the demolition of the Valley Road School Building in the belief that it has the potential to become a valuable resource for the Princeton community, made its case for restoring and converting the building into a viable community center, housing non-profits, civic organizations, and arts and cultural groups. Plans to make the University Medical Center at Princeton accessible to the local community once the hospital moves to its new facility in Plainsboro next spring continue to evolve. Patients who currently walk to the hospitals charity care clinic will be eligible for free transportation from the current hospital site in the heart of Princeton to the new complex on Route 1, where the new clinic will be established. Subsidized service for senior citizens, who currently have access to free transportation to the hospital through the Crosstown 62 service, will continue at the new site. A proposal to develop the vacant site most recently occupied by Olive May grocery is currently being re-evaluated due to strong objections from neighborhood residents about its size and scope. The plan was submitted to the Regional Planning Board on July 19 by the owners, the Carnevale family, represented by Linda Fahmie, principal and founder at ROI Renovations and leasing agent for the property. At its Monday evening meeting, Township Committee agreed to postpone a public hearing on the ordinance that would establish the Townships share of the Arts, Education, and Transit zone (AET), and approved a bond ordinance that would provide a supplemental appropriation to support expenses associated with the new pool project. Greg Gardner knows what it is like to get a Division I mens ice hockey program off the ground. Pete has a problem. Hes happily married to Sarah, but has just found out that his first wife Jessica, presumed dead from a mountain climbing accident, is alive and well and eager to return to her life with Pete. Suddenly, Pete finds himself confronting two wives, neither of whom knows about the other.